What do flamingos and marine iguanas eat in Galapagos? 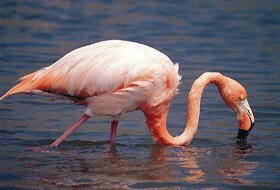 Flamingos feed on brine shrimp in shallow lagoons, while marine iguanas eat algae that adhere to rocks on the coast and underwater. 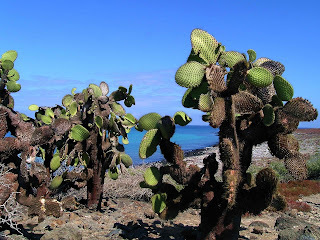 Also found in this area are succulents, such as purslane, which are food for land iguanas and insects. Other marine life that thrives in this area includes mollusks, crustaceans and invertebrates. 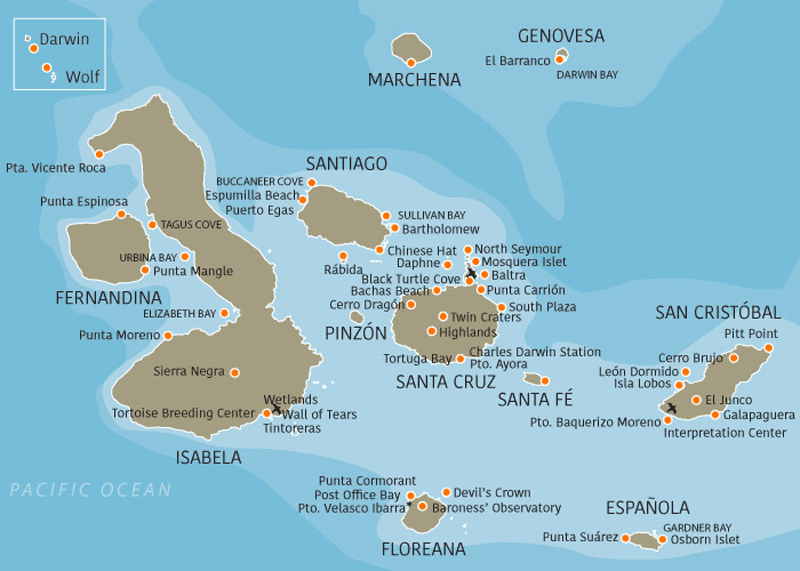 Floreana, North Seymour and South Plaza are examples of islands that have a prominent coastline. Changes in vegetation in Galapagos are also evident as elevation differs. The littoral (or coastal) zone is a narrow band along the coast. It is the home of those plants that are salt tolerant; mainly mangroves (red, black, button and white), which offer refuge between their extensive roots for juvenile fish and the protection between their branches and leaves for seabirds. Chamizo is low to the ground, offering shade for sea lions and a nesting area for pelicans and frigates. 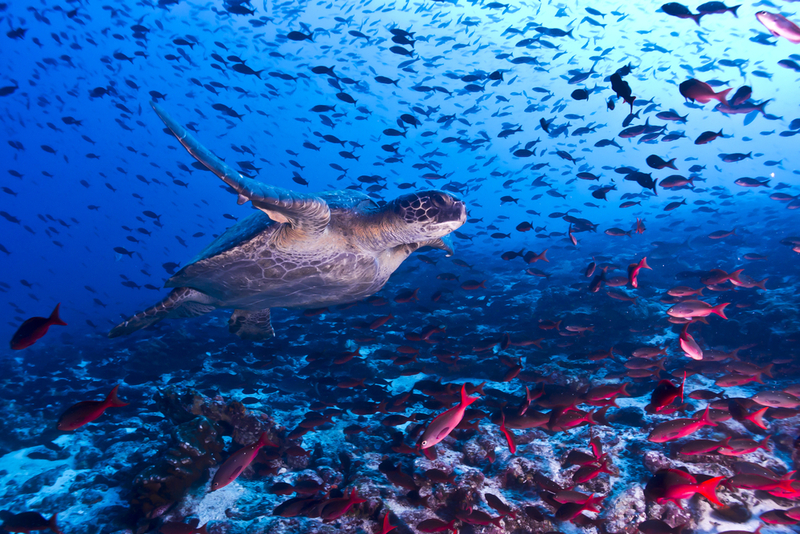 The archipelago supports more than 5,000 species of flora and fauna, and the islands conserve close to 95 (95) percent of their initial biodiversity. 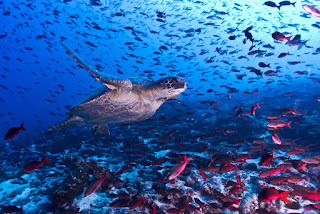 Hundreds of the species found in the Galapagos are endemic, which means that they are not found anywhere else on earth. 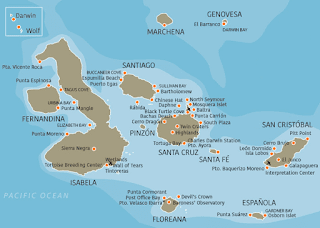 In addition, there is a notable distinction in some species from one island to the next. For example, there are obvious differences in the giant tortoises found in the different islands. 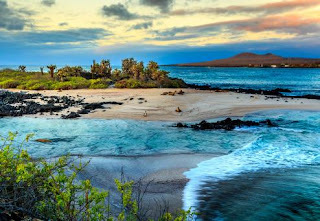 The Galapagos Islands, an isolated archipelago of approximately 125 volcanic islands and islets stretching 224km (224km) from north to south, extend into Ecuador about 1,000km (620mi) off the west coast of Ecuador. The islands are home to a very unique set of wildlife. In fact, 70% of the plants and animals in Galá payments are found in kayak, wildlife observation, horse riding, cycling, trekking, surfing, diving, hanging out on the beach, and of course, shopping and relaxing in an outdoor cafeteria. 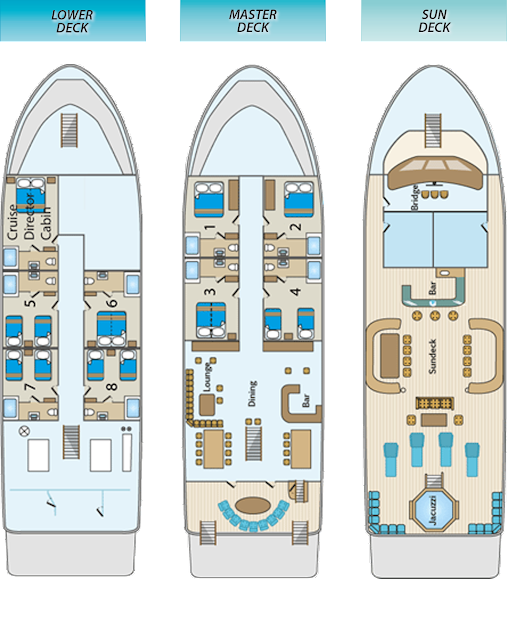 The Majestic Explorer comfortably accommodates 16 passengers in 8 air-conditioned rooms, all of which have private bath and shower facilities. Six of the eight cabins have twin beds and all cabins can be converted to queen beds for couples. All cabins have dressers, closet and windows to maximize the view of the Pacific Ocean and Galapagos Archipelago. 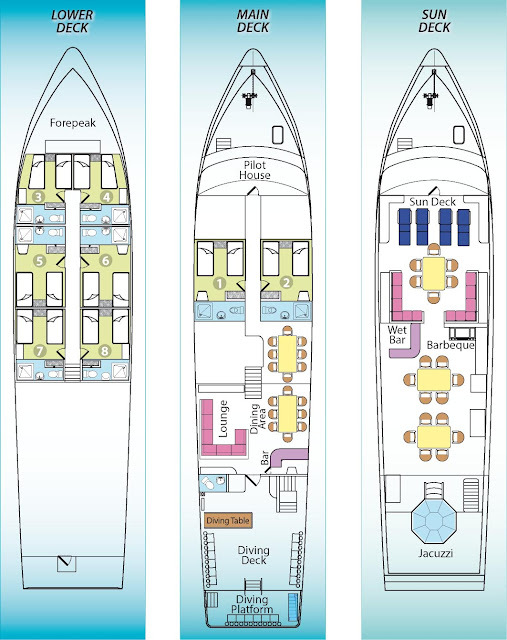 Cabins are located on the main and lower decks. The air-conditioned salon on the main deck includes dining tables, TV, CD/DVD, video library and lounge area. Sunning/viewing areas, ample seating and a hot tub are located on the top deck. The dive deck is equipped with individual gear bins, camera table, recharging station, air and nitrox filling stations, tank racks, and a separate fresh water rinse tank for underwater camera equipment. Diving operations are conducted from two large pangas (tenders), easily boarded from the dive deck. The Majestic Explorer is also equipped with a satellite telephone for emergency calls worldwide. 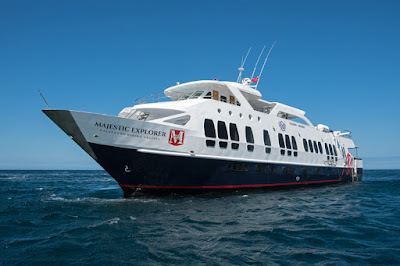 The elegant & spacious 16-passenger M/V Majestic Explorer provides 8 air-conditioned rooms located on the main and lower decks; all of which have private bathrooms and ocean views. Six of the eight cabins have twin beds and all cabins can be converted to queen beds for couples. The yacht features partially covered sun deck with a jacuzzi and ample seating, salon area with dining, bar and entertainment area. The large dive deck includes a bathroom, large camera table with charging station, individual storage areas, rinse bins for cameras and another for gear. Diving operations are conducted from two large pangas (tenders), easily boarded from the dive deck. Accommodations: 16 passengers in 8 air-conditioned rooms on main and lower decks, all with private bathrooms and showers. Six of the eight cabins have twin beds and all cabins can be converted to queen beds for couples. Up to 9 crew and 2 guides in the Cruise Director Cabin. Safety Equipment: Life rafts (2), life rings/strobes, life vests/strobes, emergency position locator, flares, oxygen, defibrillator and first aid equipment. 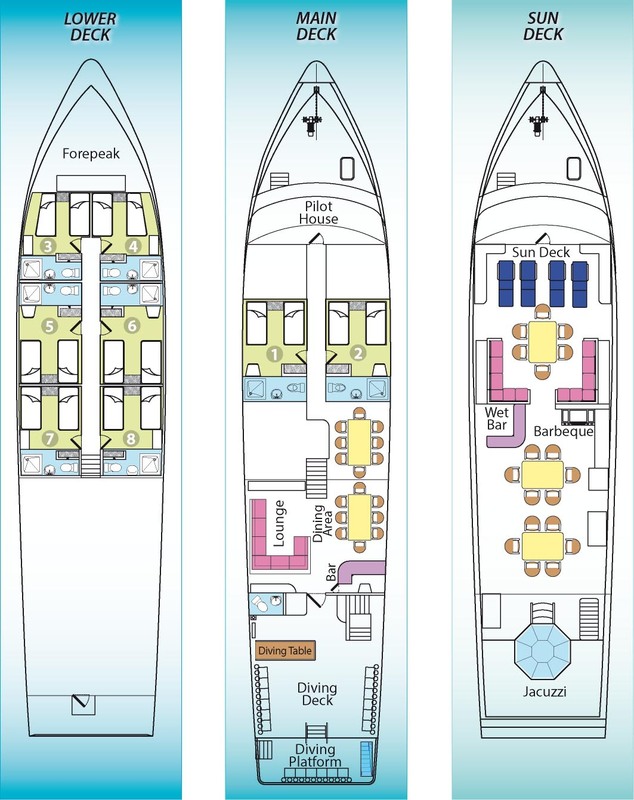 The Humboldt Explorer comfortably accommodates 16 passengers in 8 air-conditioned rooms, all of which have private bath and shower facilities. Most cabins can be arranged to provide two twin beds or one large bed depending on guest needs. All cabins have flat screen televisions and windows to maximize the view of the Pacific Ocean and Galapagos Archipelago. Cabins are located on the main and lower decks. The air-conditioned salon on the main deck includes dining tables, TV, CD/DVD, video library and lounge area. A partially covered sundeck with jacuzzi and ample seating areas is located on the top level, and a salon including a lounge area, a spacious dive deck with a large camera table are just some of the features. The 16-passenger Humboldt Explorer provides 8 air-conditioned rooms located on the main and lower decks; each has a private bathrooms, flat screen television and ocean view. All rooms except rooms 3 & 4 (forward below deck) can be converted to either one queen bed or two twin beds. The yacht features partially covered sun deck with a jacuzzi and ample seating, salon area with dining, bar and entertainment area. Safety Equipment: Life rafts (2), emergency position locator, flares, oxygen, defibrillator and first aid equipment. Air Systems: 2 electric Bauer compressors with nitrox membrane, producing 32% nitrox.